There are two types of metal used for draught beer systems: Stainless Steel and chrome plated brass (CPB). Using chrome plated brass as a metal for equipment is highly discouraged. All contact parts (parts that come in contact with the beer) should be Stainless Steel. 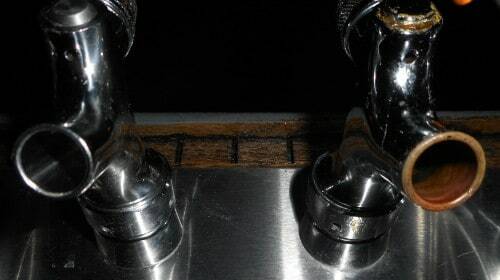 In the image on the right, you can easily spot the difference between Stainless Steel (left) and CPB (right) faucets. Also, see the growth on the CPB faucet face and none on the stainless? Beer is an acidic liquid (~5 ph). When brass is exposed to an acidic liquid the chrome wears off quickly and exposes the brass. It then becomes pitted and leeches very small amounts of lead. 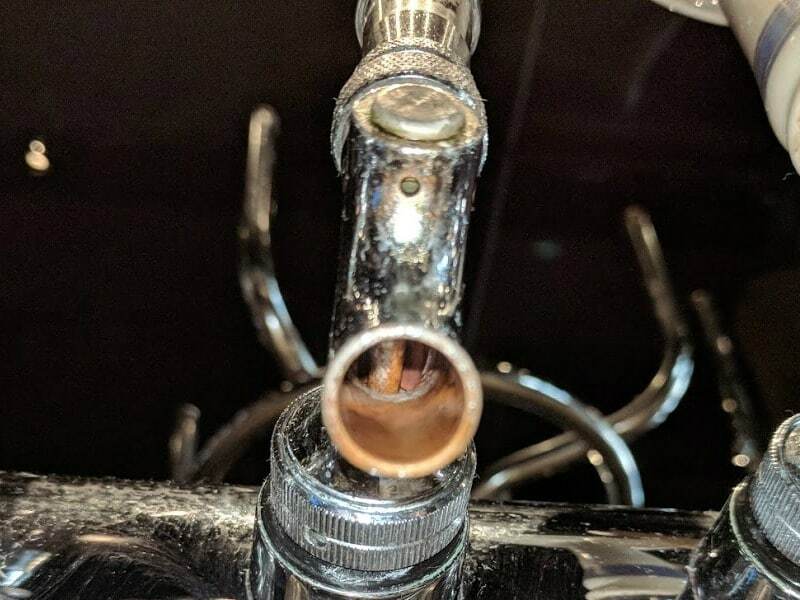 Image on the left - a rusty plunger up, inside the faucet and growth inside the vent which makes it almost impossible to get a proper pour. Click on the image to zoom. Beer from CPB faucets is sometimes described as having a metallic taste - or "tappy". The Food and Drug Administration in the US sees the danger; they restrict the use of brass in low PH applications such as draught equipment. This situation becomes a critical issue in establishments serving cider on tap. The higher acid in cider accelerates the process of breaking down the veneer of chrome on the tap which reveals the brass underneath. There are two grades of Stainless Steel faucets available: 303 and 304. Both grades are typically the same price. Cider and wine on tap should only have 304 grade. A good rule is to only buy 304 grade Stainless Steel so you can add a cider on any of your lines. If you have any CPB faucets, replace them with 100% Stainless Steel. Don't want a big capital expense? Then just change two faucets every time the tech comes in to clean your lines and in several months, you'll have all new Stainless Steel faucets and be good for years to come. Thanks for being a client, we appreciate your dedication to Better Beer.